Many of you will recall, back in 2013 City of Toronto Planning staff completed a study of restaurants and related uses along Queen Street West between Dufferin Street and Roncesvalles Avenue and the impact that these were having on other commercial uses along Queen Street West as well as on the surrounding residential uses north and south of the street. 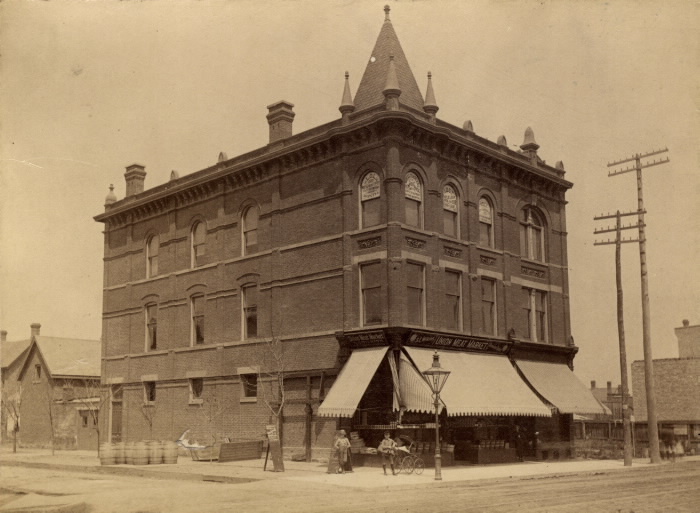 Upon completion of the Study, City Council passed By-laws 1049-2013 and 1050-2013 placing certain restrictions on restaurants such as limiting their size and location within a building. Additionally, these By-laws placed a maximum on the number of restaurants permitted to be located in Areas A-D, limiting the concentration of restaurants to no more than 25% of the properties within each of these areas. City Council direct the City Solicitor and City staff, as appropriate, to attend at the Local Planning Appeal Tribunal to support the proposed amendment to area specific Zoning By-laws 1049-2013 and 1050-2013 to delete clause 1. 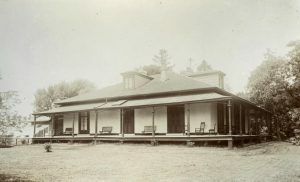 (4) and 2. (1)(A) respectively, limiting the permitted concentration of eating establishments, and to amend Map 1 to remove area designations (Area A-D), for reasons set out in the report (April 16, 2018) from the Acting Director, Community Planning, Toronto and East York District. City Council direct City Planning staff to conduct another analysis in 2023 of the impact that eating establishments are having on the main street function of Queen Street West between Dufferin Street and Roncesvalles Avenue and of the continued land use conflicts, if any, between eating establishments and the surrounding residential neighbourhood, and assess whether there are any further concerns which would warrant another restaurant study. Please click here for a recent article in the Toronto Star regarding the lifting of the cap. 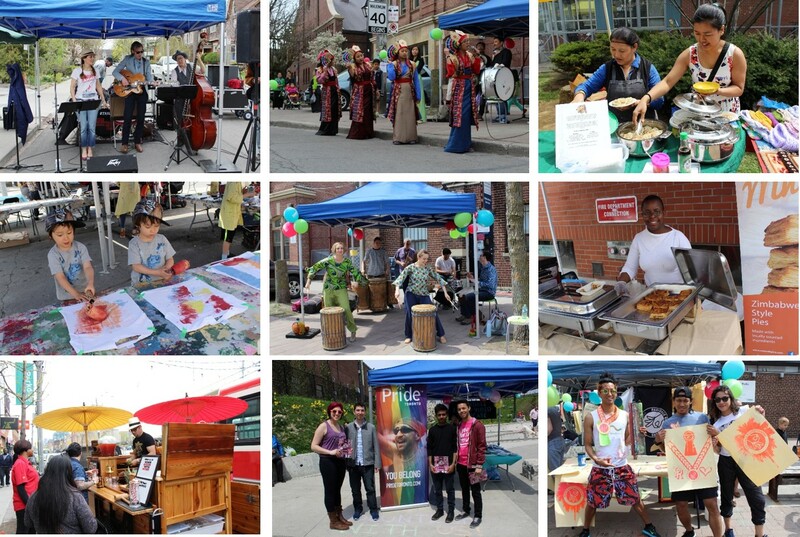 Spring Festival Photos & a BIG thank you to Parkdale! 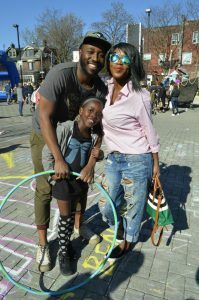 What an incredible 6th Spring into Parkdale Sidewalk Festival & Night Market! 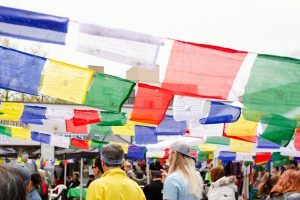 This years event saw the return of the 10,000sqft food market, an even bigger 10,000sqft Kids zone, a Little Tibet market, Zero Waste Fair and so much more!!! 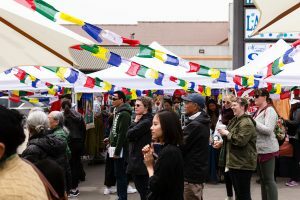 Thank you to all the volunteers, board & committee members as well as businesses, artists, residents, participants and partners such as Foodora, The Boulevard Club, Toronto Parking Authority, Students for a Free Tibet Canada, Zero Waste Hub Toronto, & Roncy BIA who helped make this an incredible success. View more event photos on Facebook here or the Kids Zone portraits here. Photos: Snapd Bloor West, Becca Gilgan Photography, Worker Bee Supply, Parkdale Village BIA, Facebook, Instagram, Twitter. 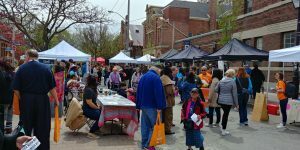 The Parkdale Village Business Improvement Area (BIA) represents over 350 businesses and property owners in Parkdale Village along Queen Street West from Dufferin Street to Roncesvalles Avenue, providing diverse retail shopping opportunities and excellent entertainment venues. Our dining establishments reflect the character of Toronto, in that you can find food from every corner of the planet here: from Tibet to the Caribbean and more. 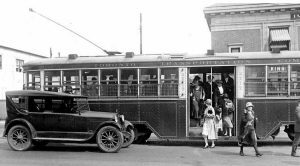 We have a thriving vintage and antique shopping district in our west end that anchors our sense of history and there are several galleries in Parkdale that display the amazing talents of the many artists who live in the neighbourhood. Working closely with the Executive Director, the Marketing Coordinator will work to support some of the BIA’s Marketing & Communications initiatives. 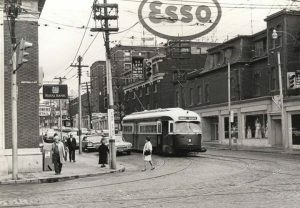 Ability to arrange your own travel and be able to spend extended periods standing and walking along Queen Street West. 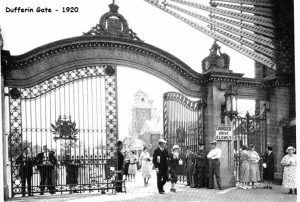 be legally entitled to work in Canada in accordance with relevant provincial or territorial legislation and regulations. Send your cover letter & resume to [email protected] with ‘Marketing Coordinator” in the subject line, and include 1-3 examples of your written or online work. 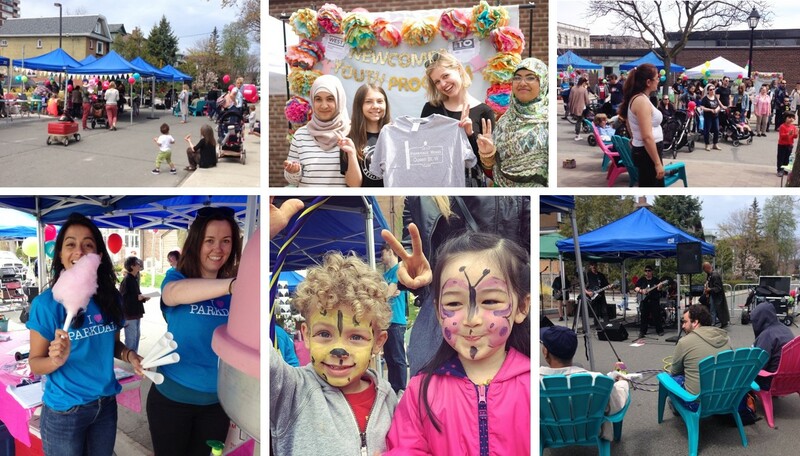 Working closely with the Planning Coordinator, the Streetscape Assistant Coordinator will work to support the BIA’s mandate to improve, maintain, and progress a vibrant and safe public realm in Parkdale. The greater part of this program will be to undertake an audit of all BIA-owned streetscape assets and other street infrastructure as necessary, to identify maintenance needs, program gaps, and current condition of assets. Accurate record-keeping and data input of information including: location, identifying information, condition of asset, maintenance needs, etc. Contributing to the coordination of other areas and initiatives as directed. Strong customer service with superior interpersonal oral and written communication skills. Interest in community, local-level planning, and non-profit organizations. 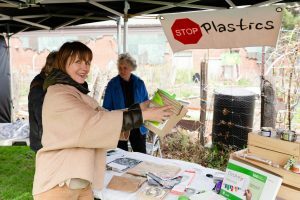 Ability to communicate effectively and build relationships with a wide variety of stakeholders, including staff, volunteers, community groups and members. Proficiency in MS Office (Word, Excel, PowerPoint). Proven ability to balance multiple assignments and tasks simultaneously. Experience supporting community level coordination of projects or events. Knowledge of Parkdale Village community and businesses. The PVBIA is committed to providing equitable access to opportunities and experiences to people facing economic disadvantage, discrimination and/or barriers to equal opportunity including those from equity-seeking communities protected by human rights legislation. 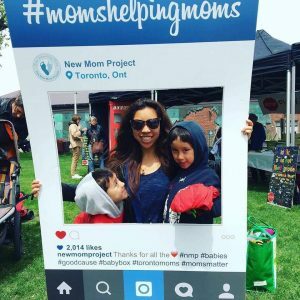 These communities include, but are not limited to: Aboriginal communities, racial minorities, persons living with disabilities, women, newcomers, youth, LGBTQ2S+, and vulnerable populations including people who are homeless or under-housed, and persons living with mental health challenges. In doing so the PVBIA aims to achieve positive outcomes and experiences for people disproportionately affected by poverty and discrimination. 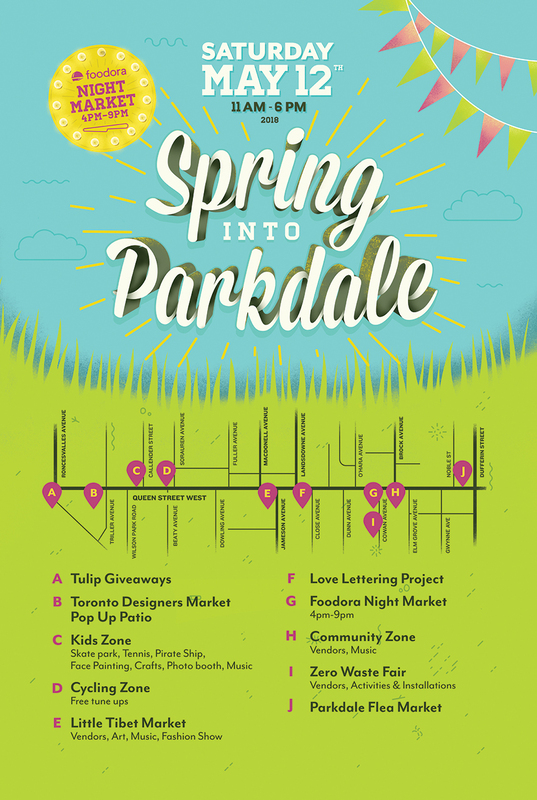 May 12th Spring into Parkdale Festival – Little Tibet Market, Zero Waste Fair, DJ Fluffy Souffle, Tennis & more! 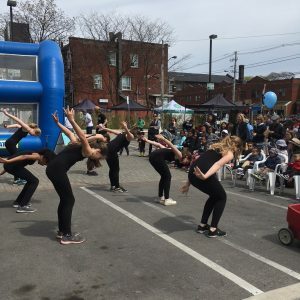 The countdown in ON for our Saturday May 12th Spring into Parkdale Sidewalk Festival & Night Market – We’re bringing back some of last years favorites and launching a few new attractions! 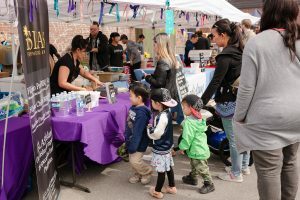 Foodora Night Market (4pm-9pm): With the success of last years Foodora Night Market it was clear visitors loved the eclectic tastes of Parkdale Chefs. 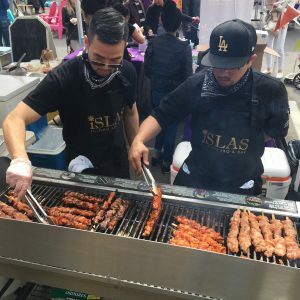 This years 10,000 sqft food market features more scrumptious food from glorious doughnuts, Filipino BBQ, to Tibetan & Japanese cuisine, patio seating and tunes by DJ Sparkdale! 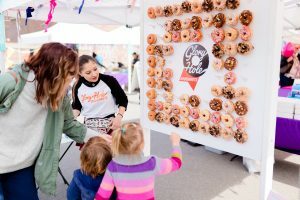 Food can be purchased from individual vendors. *Receive a $10 Foodora Voucher with your purchase (*first time Foodora customers) and don’t forget to fill out a Ballot & win $200 towards your favorite Parkdale Restaurant!. 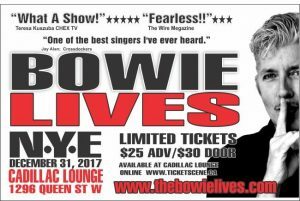 (1325 Queen St W @ Cowan). Tents generously provided by Roncy Rocks. Smash! 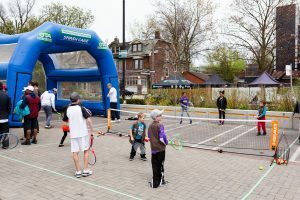 : Grab a tennis racket and check out The Boulevard Club inflatable ‘Smash Zone’ – how fast can you hit the tennis ball!? Say Cheese! 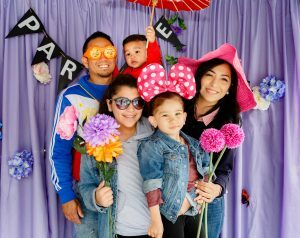 : Grab a silly prop and let photographer Becca Gilgan snap a photo portrait of your family or crew. All images are free & posted on Facebook after the Festival. Mobile Skate park: Get those kids on some wheels! Learn to skateboard or scooter at the Evolve mobile skate park, equipment and instructors available on site! DJ Fluffy Soufflé: Unabashed, unapologetic, and loads of fun, Miss Fluffy Soufflé is sure to keep the whole family entertained and on their feet! Pirate Life: Join the crew and search for treasure! 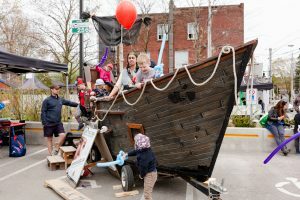 The pirates have sailed into Toronto and need your help to solve the mysteries and riddles! 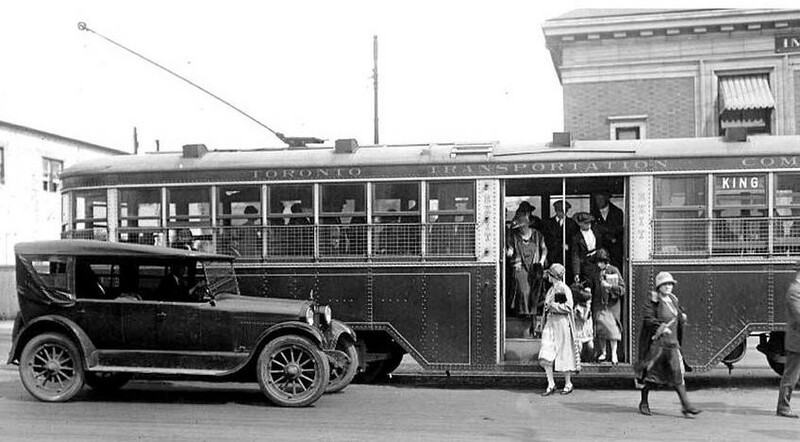 Climb aboard and partake in the adventure! 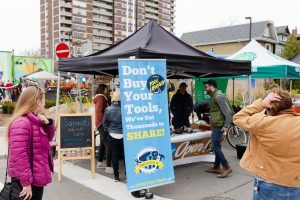 The Cycling Zone: Visit the Cycling Zone where you can get a free bike tune up and learn more about local cycling advocacy groups and projects. This is a side road closure located next to the Kids Zone (1624 Queen St W @ Callender). 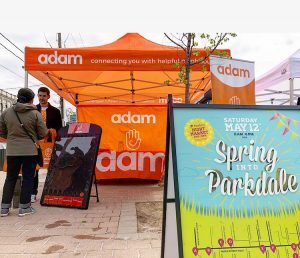 The Community Zone: Brought to you by Adam Helps, is a 5,000 sqft road closure located at Cowan Ave and features local groups and agencies doing incredible work within the Parkdale Community – come & support a cause, spin to win, donate or learn more about getting involved! (1313 Queen St W @ Cowan). 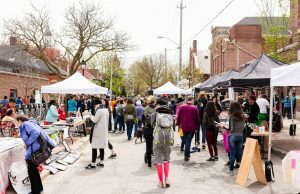 Parkdale Flea Market: Browse this special Spring Festival edition of the Parkdale Flea Market, bringing together some of the best and most unique products from Antiques, Vintage, Collectables, Local Artisans and Designers. 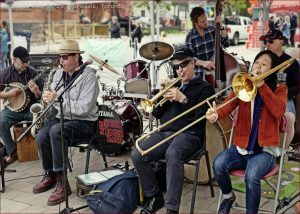 This bigger then ever Flea starts at the Dufferin Amphitheatre and weaves all the way down Noble Street (1266 Queen St W @ Noble). Sidewalk Sale: Browse dozens of local deals, vendors, artisans along Queen West from Roncesvalles to Dufferin! Visit local shops as they offer deals inside and out as well as giveaways or special attractions and entertainment! 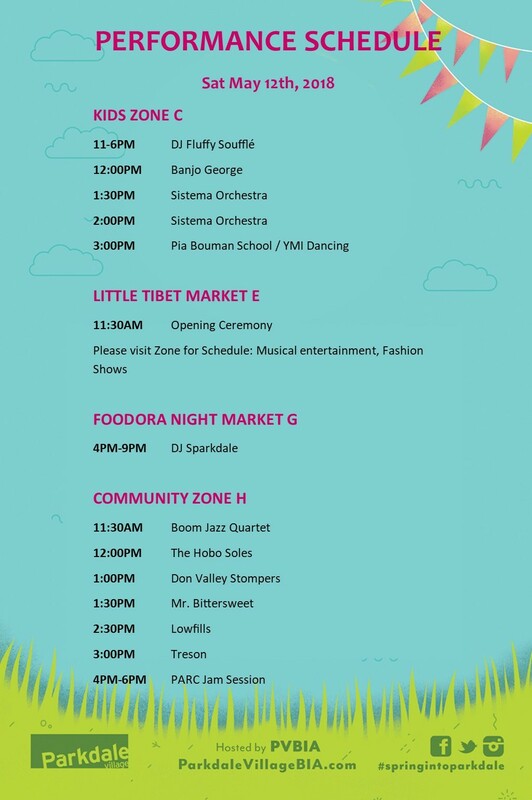 Performance Schedule: Enjoy musical performances at 4 Zones! Thank you Sponsors, Partners, BIA Members & Visitors! 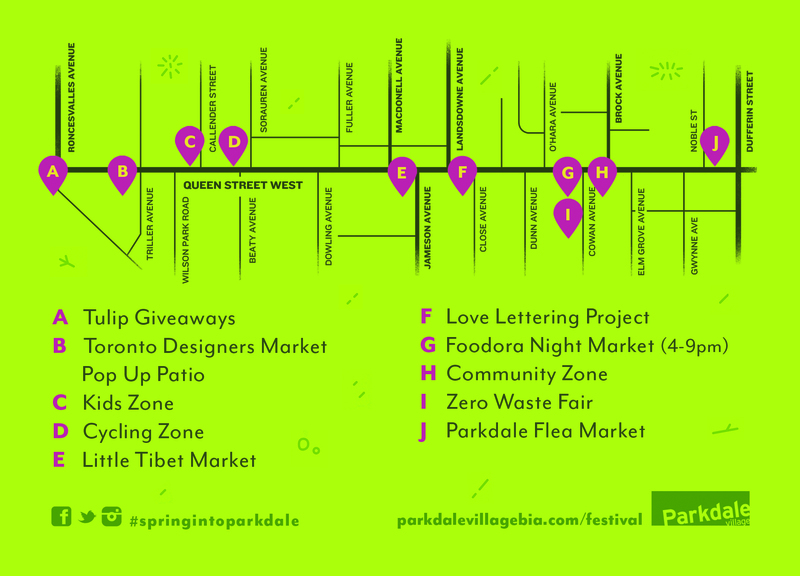 The Spring into Parkdale Sidewalk Festival & Night Market is brought to you by the Parkdale Village BIA, Foodora, The Boulevard Club, Adam Helps, Toronto Parking Authority, and is in partnership with Zero Waste Hub Toronto, Students for a Free Tibet Canada and TABIA. Thank you for your support and commitment to Parkdale Village! The Parkdale Village BIA is looking for volunteers to lend a friendly hand during our outdoor Festival on Saturday May 12th, 2018 – in Parkdale! If you love Parkdale, are friendly and excited to support the community and local businesses, please fill out our Volunteers Application Form and email it to [email protected] along with your resume and list any relevant past volunteer experience. Up to 30 Volunteer positions and a few paid positions are available for a series of three (3) to six (6+) hour shifts, scheduled between 8:00am & 11:00pm. Volunteers/Staff may be required to participate in an orientation session. 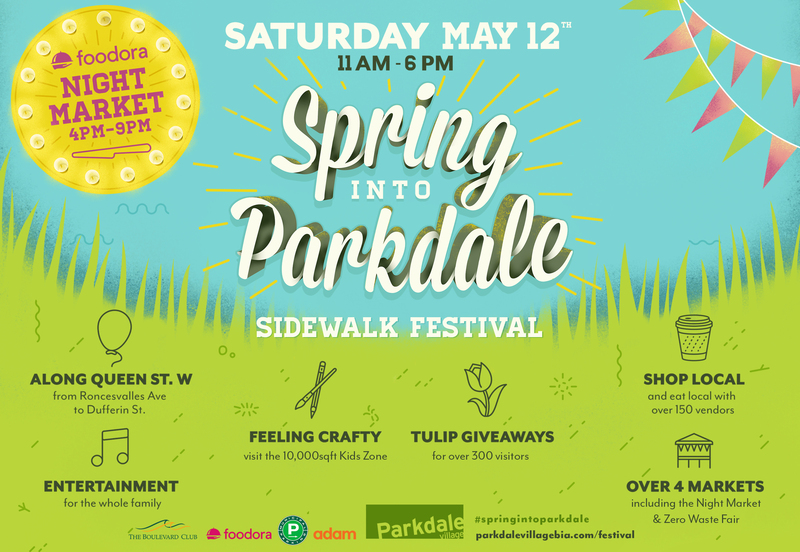 The Parkdale Village Business Improvement Area (PVBIA) invites you to Spring into Parkdale Sidewalk Festival on Saturday May 12th, 2018! 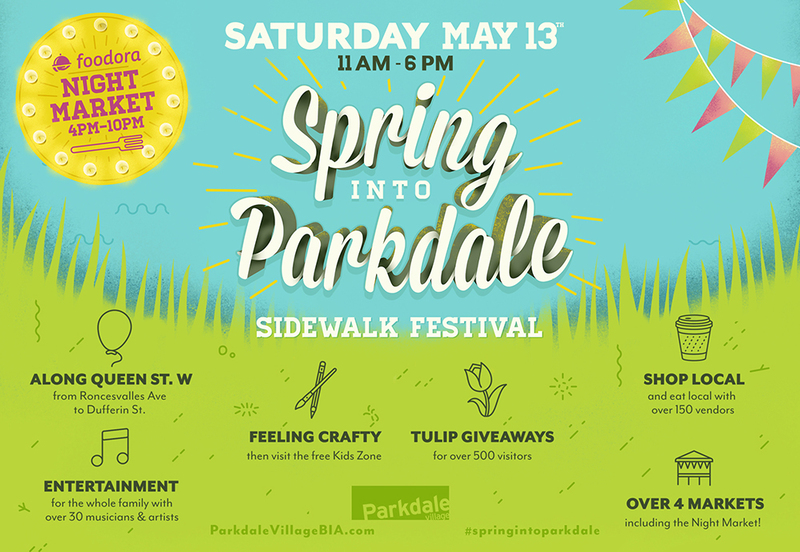 Time to shake off those winter blues and visit Parkdale Village’s Queen Street West this spring for a weekend filled with sidewalk sale deals and free fun for the family. 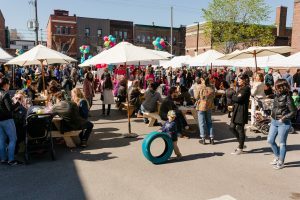 Come out and meet shop owners, crafters, artists and community groups that make up our thriving neighbourhood! 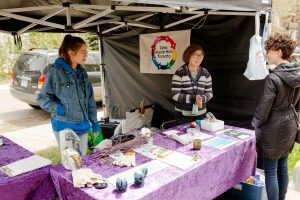 Throughout the day enjoy some special attractions such as live performances, free craft workshops, Markets and surprise giveaways! 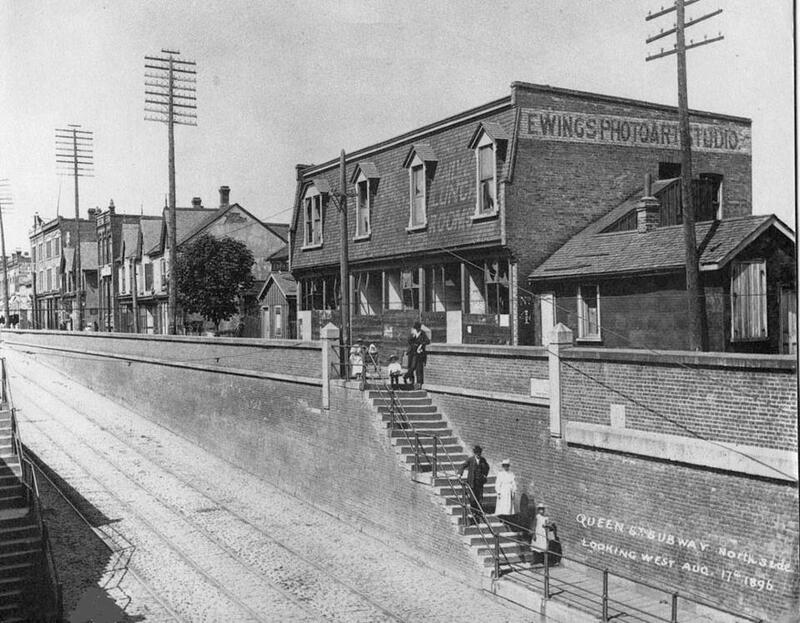 The Parkdale Village Business Improvement Area (BIA) represents over 350 businesses, organizations and commercial property owners in Parkdale Village along Queen Street West from Dufferin Street to Roncesvalles Avenue, providing diverse retail shopping opportunities and excellent entertainment venues. Our dining establishments reflect the character of Toronto, in that you can find food from every corner of the planet here: from Tibet to the Caribbean to Vietnam to Indian and more. 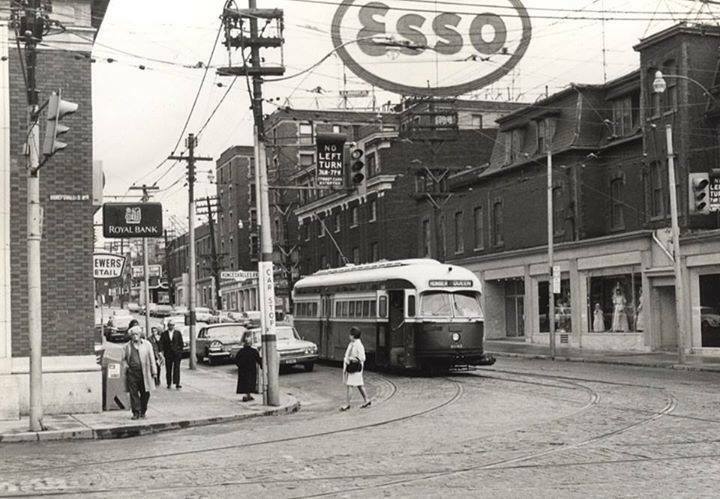 We have a thriving vintage and antique shopping district in our west end that anchors our sense of history, and there are several galleries in Parkdale that display the amazing talents of the many artists who live in the neighbourhood. The Planning Coordinator position will assist primarily with the execution of streetscape projects, all related administrative duties and some marketing support as needed. This position reports to the PVBIA Executive Director and works closely with the PVBIA Board, Members, third parties, external suppliers, community leaders, residents and volunteers. Assisting with processing permit applications and service requests to the City of Toronto. Administrative support including, but not limited to filing, fielding calls, research, sourcing, customer service, general inquiries, etc. Relevant Post-Secondary Degree or equivalent experience. General understanding, interest and experience in urban planning, economic development or relevant disciplines, administrative processes involved, as well as some marketing interest an asset. Interest in community and local-level planning, and non-profit organizations. Ability to communicate effectively and build relationships with a wide variety of stakeholders, including city staff, volunteers, community groups and members. Strong personal initiative combined with superior interpersonal oral and written communication skills. Ability to work flexible hours as needed (particularly evenings and at event time). Experience working with or volunteering for another BIA. Call for Vendors, Entertainers Now Open – Spring Festival 2018! 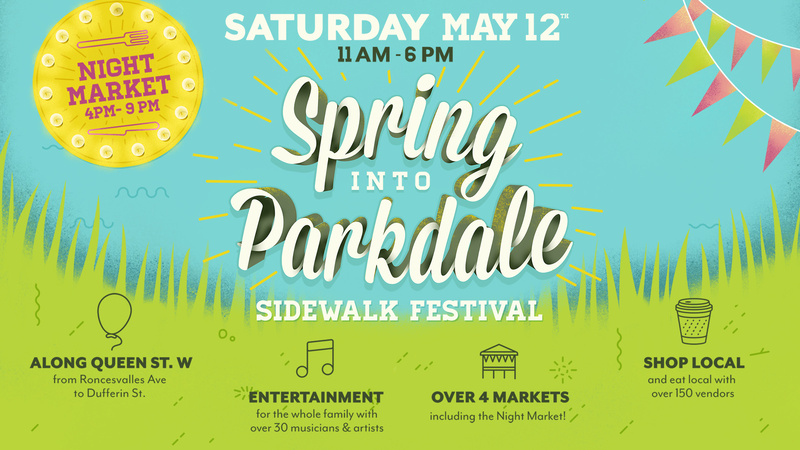 The PAVBIA is excited to share that planning has kicked off for the 6th Annual Spring into Parkdale Sidewalk Festival & Night Market on Saturday May 12th with some amazing additions in the works for 2018. 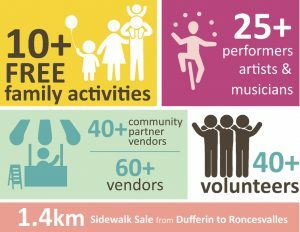 Featuring a sidewalk sale with over 100 vendors, live entertainment and FREE family-friendly activities. 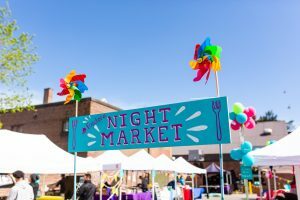 Take part in the 1.4km sidewalk sale, and visit one of 4 markets including the 10,000 sqft outdoor Night Market showcasing Parkdale’s eclectic food and chefs, and a 10,000 sqft Kids Zone! 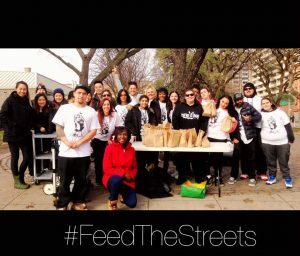 If you would like to explore ways to participate as a Sponsor, Food Vendor, Entertainer etc. 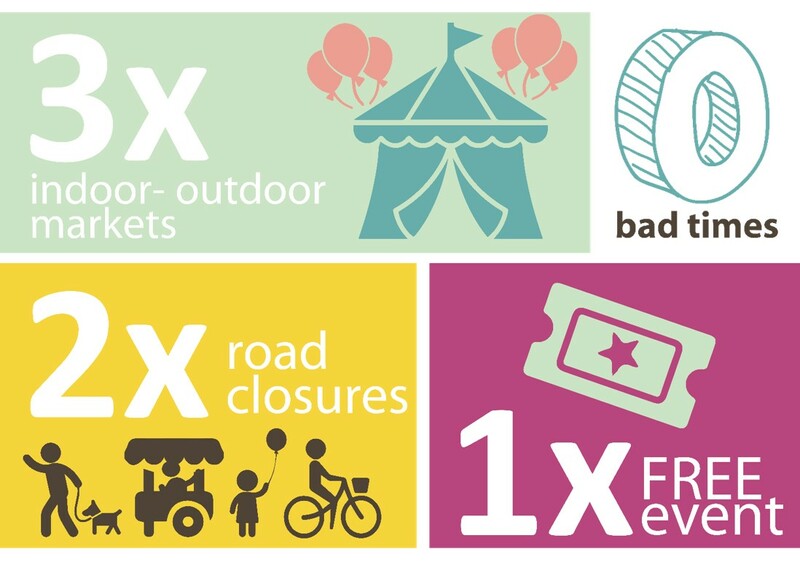 within one of our Pop Up Markets & Festival, please visit the Festival page for more info. Celebrating 139 years of Parkdale Village with a Contest! Help us Celebrate & You Could Win! 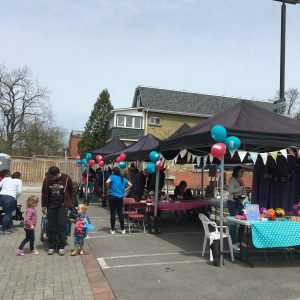 The Parkdale Village BIA invites residents, visitors, shop owners and Parkdale lovers to celebrate the 139th Year Anniversary of Parkdale Village. 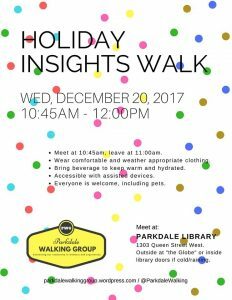 Although January 1st marks the date that Parkdale became a village, the Parkdale Village BIA (PVBIA) will be celebrating the rich history of Parkdale Village from January 26-28th, 2018 by inviting residents and visitors to take a stroll down memory lane, explore the many businesses who will be celebrating in their own ways, and enter to Win in our Contest! 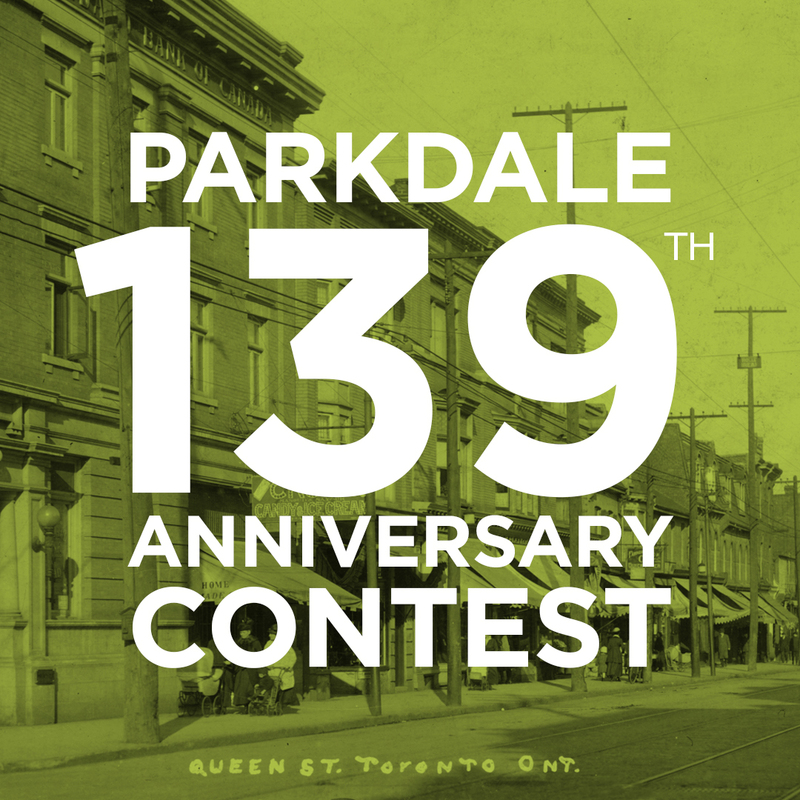 Parkdale’s 139th Anniversary Contest! We’ve got 9 days of giveaways!! We’re drawing 1 winner daily from January 20th to 28th. Win 1 of 9 prize packs, to enter simply Like, Share or Comment on our Contest post on Instagram or Facebook. 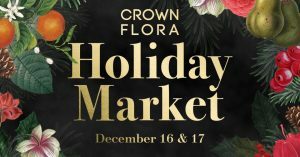 Enjoy gifts from The Public Butter, Rustic Cosmo Cafe, Isla Filipino BBQ & Bar, The Workroom, Frances Watson, 3 Fates, Kitten & the Bear, OM restaurant, CiCi’s Pizza, Common People Shop, Daiko Indian Kitchen, Easy Restaurant, The Imperative, Grocery Coffee, Plentea Tea Shop, West End Comics, Dead Dog Records, Studio Brillantine, Tibet Hair & Beauty Salon, Home Hardware & Ana Maria Hair Salon, Capital Espresso, Skyline Restaurant, The Grand Trunk, Yummy Stuff Bakery, Klute Hair and The Old Trunk Antique Shop! 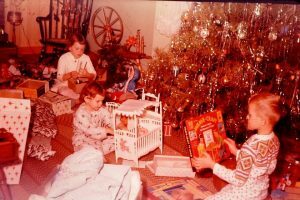 Prize pack values range from $80 – $548, one prize pack per person. Ontario residents. Winners drawn by 4pm daily. Contest runs January 18-28, 2018. 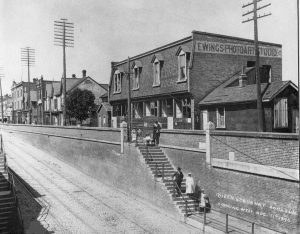 “My Home Parkdale” show at The Grand Trunk Bar on Sunday January 28th 4-9pm; showcasing a community Photography show titled “My Home Parkdale”, with images donated by residents and proceeds going towards PARC. 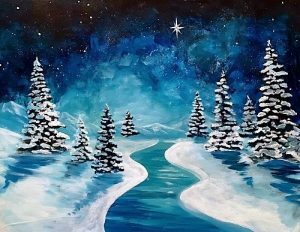 Paint Nite at The Parkdale Drink on Friday January 26th 7:15pm; Come join Paint Nite Toronto’s very first Artist owned – Artist run Licensee as we get creative in the heart of the city. Drink. Paint. Connect. 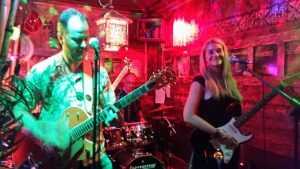 Looking for something novel to do with friends to create new memories and share a few laughs over a cocktail or two? Our professional artist will guide you, step-by-step, from a blank canvas to a final unique masterpiece in about two hours. Drag Queen Story Time at Parkdale Library; Saturday January 27th 10:30am; Celebrate Family Literacy Month, parents and children are invited to join us for a half hour of stories and songs with a fabulous drag queen, Miss Theo Rose, from the East Toronto Drag Queen Story Hour and learn about diversity in gender and gender expression. Free Sewing Classes at Parkdale Library on Saturday January 27th for 7 weeks; for Women in the Parkdale area. Childcare provided, registration required. 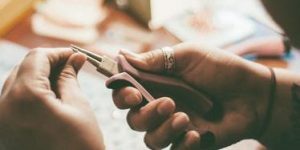 Learn to use a sewing machine, basic sewing skills which include machine skills, zippers, hand sewing, patterns, etc. 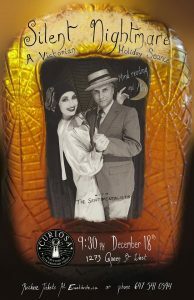 Dark Heart Play at The Assembly Theatre on Saturday January 27th 8pm; a new play by Genevieve Adam, Directed by Tyler J. Seguin. For tickets click here. Last Saturdays at T.O. 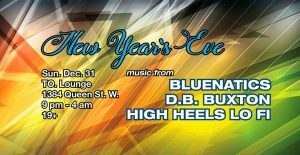 Lounge on Saturday January 27th 10pm; It’s the 1st Anniversary Spectacular for Last Saturdays /w Knife Camp! That’s right, we’ve been at our beloved TO. 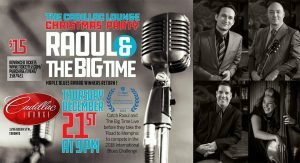 Lounge for one full year and we’ll be marking the occasion with special guest Emily McCann. Come celebrate a whole year of knifey, campy fun! Solo sets from various members of KC to open the night. No cover. 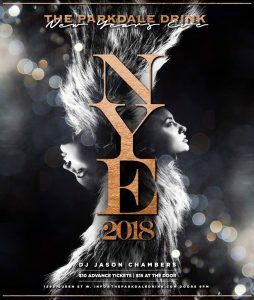 Reggae for Life at The Boxing Loft Social Club on Saturday January 27th 10pm; a $10 entrance fee with a donation of a scarf, gloves, a toque or socks going towards local shelters in need. Quilt Sunday at The Workroom on Sunday January 28th 1pm; Join us for the first Quilt Sunday of 2018! 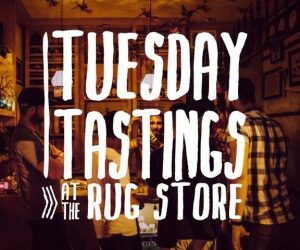 Our monthly event is the perfect opportunity to work on your current crafty project or baste a quilt with a lovely group of creative people. 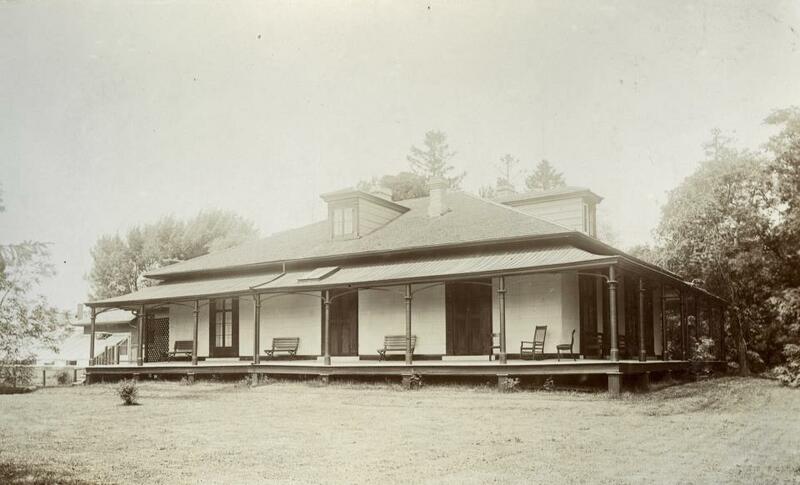 Learn more about Parkdale Village history here! 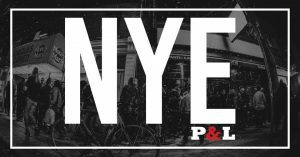 Happy New Year Parkdale Village BIA Members! 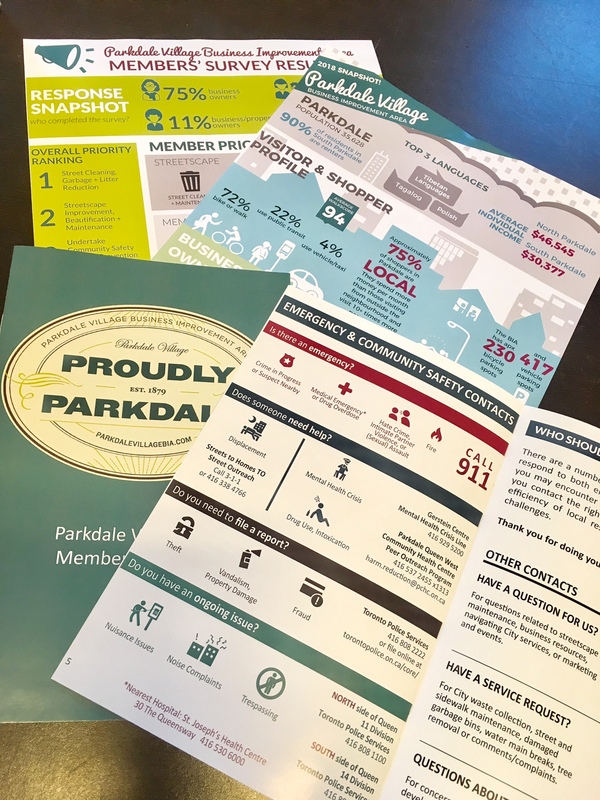 At the beginning of each year our BIA distributes new Parkdale BIA Membership Package – 2018 to Members with physical properties within the BIA. This year, based on feedback from the Members Survey we’re happy to share a more detailed Package which highlights 2018 Event Opportunities, Services & Resources as well as a new section within the Package called Emergency & Community Safety Contacts. 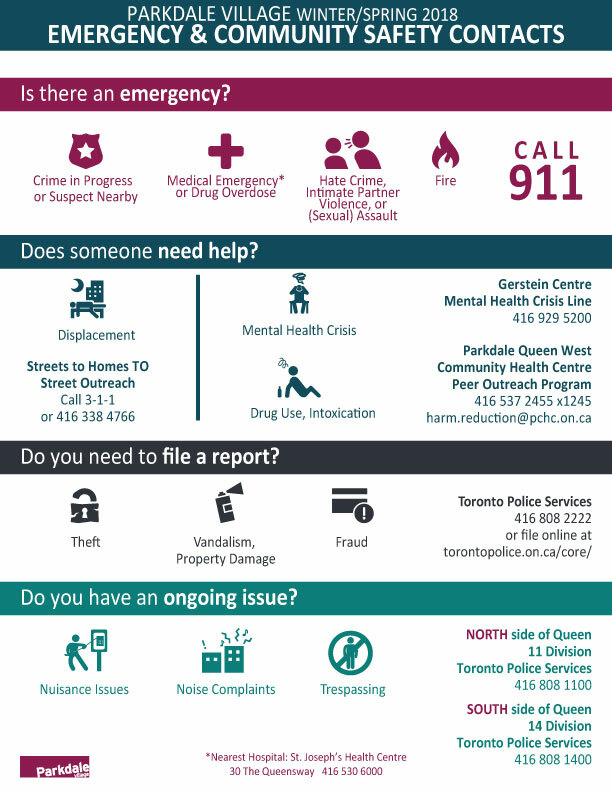 We thank the many community agencies and resources that helped us compile this Community Safety document, which we encourage you review with your staff and volunteers. 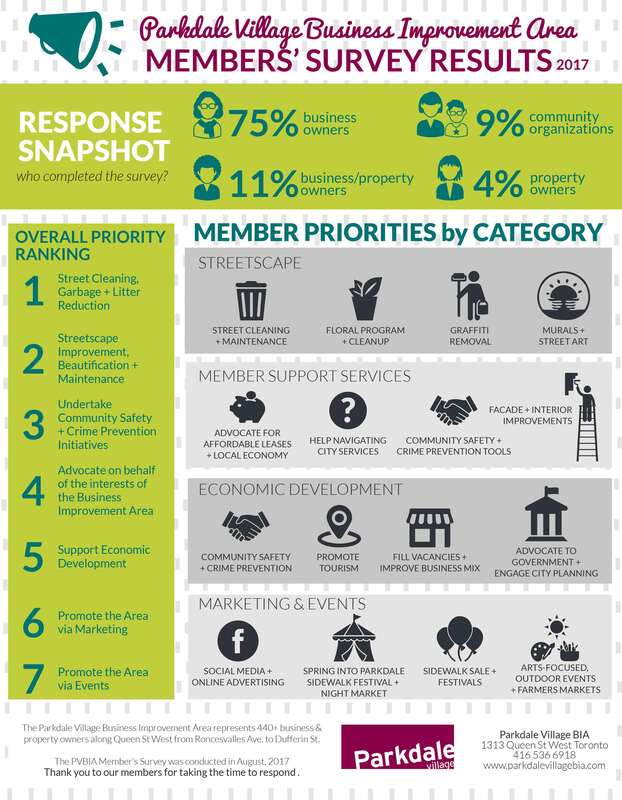 You’ll also find in the package a Summary of the Members Survey results and an updated Snapshot of the area, listing shopper and business statistics. 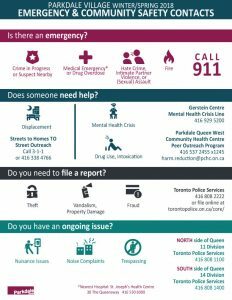 We hope you’ll find these resources helpful and we look forward to helping you navigate services and resources. If you have not received your package by January 24th, please contact us. 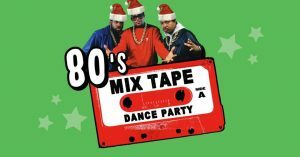 Still time to Shop, Support & Party Local! So it’s just over two weeks till New Years and you still have gift buying, charity supporting and party planning left to do! 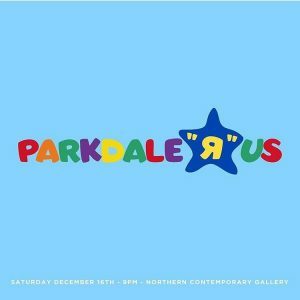 Don’t sweat it, as you know November 25th, 2017, kicked off shopping local nationwide across Canada and within hundreds of communities like Parkdale. That means that local shops still have fabulous deals on and that you still time to explore new shops and pick out unique finds that give back to your community. 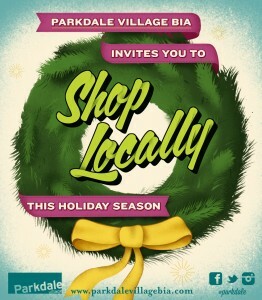 So we ask you Parkdale, to continue celebrate Shopping Local with us and take a sneak peak below for some of the fun taking place in Parkdale Village!. 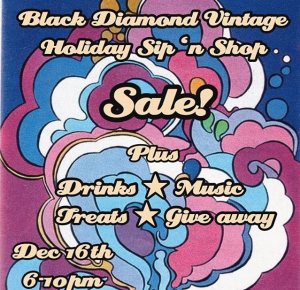 A Sneak Peak at MORE Shop Local Deals & Events this Holiday Season! 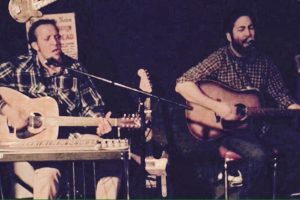 What: Berman Billings at Amicos! Last performance of 2017! 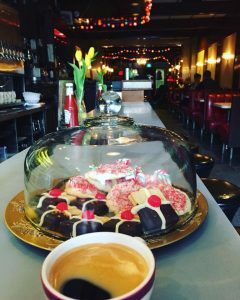 What: Cookie Drive – drop off your Parkdale Community Food Bank donation at Skyline Restaurant & get a cookie! Stay tuned for Deals and Promotions being added daily!